I wanted to share this really good example of how someone not familiar with invoice discounting and factoring quotations can end up misinterpreting the quotes, when they try to make a comparison - ending up "comparing apples with oranges". Is It A Cheaper Quote? In this particular case the prospect had two quotes, one from a provider we had found for them (the cheaper quote) and one they had sourced themselves and they (wrongly) believed it to be cheaper. 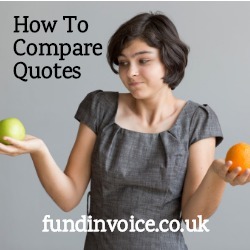 I have written before about the issues with comparing quotes, and we have a great deal of invoice finance pricing research that demonstrates how there are variations in charges and minimum fees, between different funders. In this particular case, the prospect was focused on the discount charge (similar to interest on a loan) and how that compared between the two quotes. The discount fee in the quote we sourced was in fact just over 20% more expensive than the equivalent fee in the quote they had found. However, anyone that works within invoice finance will be aware that discount is often the minority charge, and that service charge is often far more significant, especially when a company is only borrowing relatively small amounts. In this case, the discount fee only accounted for about 18% of the overall charges. The real issue was that the service charge, accounting for the remaining 82% of the fees, that we found them was about a third of the fee that they were being quoted elsewhere. They were completely overlooking this by focusing only on discount charge. Overall the huge reduction in the service charge that we had found more than negated the small increase in discount fee, delivering a large cost saving overall. In addition to this, it transpired that the quote they had sourced was non specific about the exact product that was being offered. Experience suggests to us that it is actually a factoring quote, for funding plus a collection service. This is the opposite of what they want, as they have an established in house credit control function, and want to retain that activity. Furthermore, they want a confidential invoice discounting facility, which we are offering. A case of not "comparing apples with apples", rather "apples with oranges". You would be amazed how difficult it is to compare invoice discounting and factoring quotes, and how often prospects make these kinds of mistakes. We are always on hand to help if you need to compare offers or quotes from different invoice finance companies.